Exciting new features on the Sky Princess make this cruise ship a vessel that is sure to impress even veteran cruise guests. The cruise line recently introduced an image of its Sky Suites, the accommodations situated on the top decks of the vessel. These suites are notable as they display the largest private balconies ever provided by Princess Cruises. 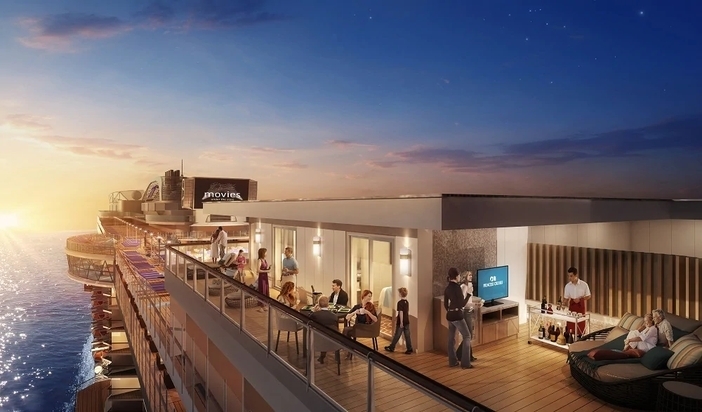 The balconies, which measure 700 square feet, make it easy to entertain, as well as enjoy the luxury cruise ship’s Movie under the Stars panoramic screen. The two deluxe suites also provide sleeping room for up to five guests. Therefore, families who wish to book a luxury cruise will love this amenity. The Sky Princess will make its debut in the Mediterranean, beginning October 2019. At that time, the 143,700-ton vessel will unveil many unforgettable features, amenities that also appear on three sister Princess ships, the Royal Princess, the Majestic Princess, and the Regal Princess. Noted new Sky Princess amenities include a Wakeview pool, added to the ship’s aft decks, deep-tank top deck pools, Jacuzzis, and a Retreat Pool, all designed for relaxing onboard ship. The new Sanctuary area will also provide a haven for guests to unwind. Cruise passengers who wish to savor a quick repast or stop in for coffee will find a friendly venue at the ship’s new featured café. If you are seeking a Mediterranean vacation, this is the ship to take in 2019.